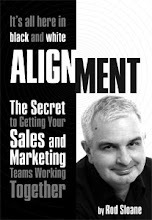 Sales and Marketing Alignment Blog from Rod Sloane: Is Marketing just an unnecessary cost? Times are hard aren’t they? Revenue’s down. The phone’s not ringing as much as it used to. Fewer people are attending your favourite networking events. This marketing stuff seems to work in the boom years, but in the lean years, isn’t time to batten down the hatches and get into the bunker? Mother, where are you when I really need you? OK, maybe I have laboured the point, but during tougher times it requires you to think harder about what you are attempting to achieve. Maybe, it’s pure survival. Maybe, you want a bit more. Get closer to your best clients. Closer than you are now. If you phone them once a month, make it every two weeks. If you call them once a week, make it twice. Double the frequency. Ask what else they are working on. Try and be a resource not a supplier. What’s your best marketing tactic? You know, that thing you enjoy doing that brings in the results. Simply get better at it and try and do it more often. If it’s networking, then when did you last brush up your skills in that area? Out of 10 how good are you and your business at it. Get better. So, stop telling me marketing’s costly and focus on what you are good at. Leave the expensive marketing to those other guys!